Received September 5, 2018; Accepted September 28, 2018. Sarcopenia is characterized as a syndrome involving the progressive or generalized loss of skeletal muscle mass and strength with or without increased fat mass. This is one of well-known risk factors for adverse treatment outcomes in patients with various medical and surgical diseases. Sarcopenia itself, independent of the body mass index, is a powerful prognostic factor for cancer cachexia, liver cirrhosis, and even all causes of mortality. In terms of gastrointestinal surgery, sarcopenia is a significant prognostic factor in patients with gastric or colorectal cancers. Sarcopenia is related to postoperative complication, 30-day mortality, overall survival, and disease-free survival after gastrointestinal surgery. For patients with hepatic surgery, sarcopenia is also a significant prognostic factor. Several studies, including meta-analysis, proved sarcopenia to be waiting-list mortality and post-transplantation mortality in liver transplantation patients. Similarly, preoperative sarcopenic obesity was an independent risk factor for death and hepatocellular carcinoma recurrence after a hepatectomy. In cases of pancreatic cancer, several studies proposed that sarcopenia was an objective measure of patient frailty that was strongly associated with the long-term outcome independent of tumor-specific factors. In addition, sarcopenia or sarcopenic obesity has been reported to be a strong predictor of major complications after pancreatectomy. As a result, sarcopenia could be used to improve patient selection before a pancreatectomy. The next step to solve the questions to manage sarcopenia and improve the post-pancreatectomy outcomes would be to determine the role of nutrition and physical activity in the prevention or treatment of sarcopenia, and to develop specific medications with an evidence-based treatment of sarcopenia in patients with pancreatectomy. 췌십이지장절제술(Pancreatoduodenectomy; PD) 또는 유문보존췌십이지장절제술(pylorus-preserving PD; PPPD)는 다양한 유두부 주위 종양(periampullary tumor)의 표준적인 술기이다. 원위부 췌절제술은 췌장의 몸통 및 꼬리에 발생하는 질환에 대한 대표적인 술기이며, 이는 비장 또는 비장혈관을 보존하는 술식, 복강동맥을 합병절제하는 술식(distal pancreatectomy with celiac axis resection; DP-CAR), 근치적 전향적 췌미부-비장절제술(Radical Antegrade Modular PancreatoSplenectomy; RAMPS) 등의 다양한 변형술식이 임상에 적용되어 왔다. [4-7] 이러한 췌절제술은 최근 수술 술기 및 수술 전후 관리의 발달로 인해, 수술 경험이 많은 기관의 경우 수술 후 사망률은 1∼5%로 상당히 감소하였으나 여전히 타 장기 수술에 비해 높은 수준이며, 또한 수술 전 환자들의 영양상태가 불량한 경우가 많고, 수술적 절제 범위가 타 수술에 비해서 광범위해 수술 후 합병증률은 현재에도 40∼60%에 이르고 있다. [8,9] 따라서 수술 후 성적을 향상시키고자 이에 관계되는 예후인자를 발굴하려는 노력은 아무리 강조해도 지나치지 않다. 최근 여러 연구에서 근감소증이 다양한 임상상에서의 예후 인자로 잘 알려져 있다. [2,10] 이는 비단 내과적 질환뿐만 아니라, 복부 수술 환자에서도 수술 후 합병증, 재원 기간, 생존률 등의 핵심지표에서 불량한 예후인자임이 밝혀지고 있다. [11,12] 그러나 상대적으로 췌장 수술에 있어서는 소수의 보고를 제외하고는 그 임상적 중요성이 잘 알려져 있지 않다. [13,14] 따라서 본 종설에서는 수술 전 근감소증이 췌절제술후 환자에게 미치는 임상적 영향 및 예후 인자로써의 가치에 대해 논하고자 한다. 근감소증은 그리스어로 근육(flesh)를 뜻하는 ‘sarx’와 상실(loss)을 뜻하는 ‘penia’가 합쳐진 용어로, 1980년대 후반에 도입되어 현재 널리 사용되고 있다. 현재까지 널리 받아들여지는 정의는 없으나, 대부분 연령이 증가함에 따라 나타나는, 보통 지방량의 증가를 동반한 체내 근육량의 감소로 받아들여지고 있다. [3,15,16] 이는 여러 연구에서 신체 활동 및 삶의 질, 생존 기간 등에 대한 불량한 예후인자로 밝혀져 있으며, 체내 근육량 감소, 근육 강도 감소, 신체 활동(physical performance) 감소의 3가지 요건으로 진단한다. [3,15,16] 일차성 근감소증은 특별한 구조적 원인 없이 연령 증가 자체로 나타나는 근감소증을 뜻하며, 이차성 근감소증은 그 원인인자가 뚜렷하게 밝혀졌을 때로 분류하며, 보통 이차성 근감소증은 다발성 원인에 의해서 발생하는 것으로 알려져 있다. [3,15,16] 이러한 근감소증은 그 중등도에 따라 단계(grade)적으로 분류하며, 이는 임상상에 따라 치료 방침을 세우는데 도움이 된다. Diagnostic method using CT scan for sarcopenia (A-F). Visualization of skeletal muscle and intraperitoneal fat volume. 위장관계 암으로 이환된 환자들에게 있어 근감소증이 미치는 영향은 활발히 진행되고 있다. 위암 환자를 대상으로 한 메타분석에서는 근감소증이 수술후 합병증, 재원기간의 유의미한 불량한 예후인자임을 보고하였다. [11,23] 이러한 영향은 대장암의 경우에도 마찬가지이며, 술전 근감소증은 대장암 환자에서의 수술후 합병증, 재원기간, 의료비용, 생존 기간 등의 불량한 예후인자라는 여러 보고가 있다. [23-25] 이를 종합하여, 2017년에 보고된 메타분석은 영상학적으로 진단된 술전 근감소증은 복부수술에 있어서 수술후 합병증, 재원기간 내 사망률, 암 사망률에 대해 독립적인 불량한 예후인자임을 보고하였다. 간이식을 시행받은 환자들에 대해서도, 술전 근감소증이 불량한 예후인자임은 주지의 사실이다. 이식전 근감소증은 간이식을 시행받기 전 사망률(Waiting list mortality)과 이식 후 사망률(Post-transplantation mortality)에 모두 악영향을 끼치는 것으로 알려져 있다. 간이식 이외에, 간세포암으로 인한 간절제술에도 근감소성 비만이 생존률, 간세포암 재발에 있어 불량한 예후인자임을 보고하는 연구도 있다. 위장관계 및 간암에 대한 근감소증이 활발히 연구되고 있는 반면, 췌절제술 및 췌장암에 대한 근감소증에 대한 연구는 상대적으로 많이 알려져 있지 않다. 다른 장기 수술에 비해 수술 후 사망률 및 합병증 빈도가 현저히 높은 췌장암 및 췌장수술의 특성상, 예후인자로써의 근감소증은 상당한 가치를 가질 수 있다. 미국외과학회 합병증데이터베이스(ACS-NSQIP database)에 따르면 근감소증은 술 후 주요 지표인 재원기간, 감염성 합병증, 위배출 지연 등에 독립적인 불량한 예후인자임을 보고하였다. 이러한 영향은 근감소증 자체보다는 지방량을 반영한 근감소성 비만에서 더욱 뚜렷한 경향을 보이는데, 2016년 한 연구에서는 CT를 이용하여 근감소증 및 근감소성 비만을 측정한 후, 근감소증 자체보다는 근감소성 비만이 췌십이지장절제술 후 주요 합병증의 유일한 결정인자(determinant)라고 주장하였다. 근감소증은 수술 후 합병증 등에 미치는 결과와는 별도로, 종양학적 결과 자체에도 영향을 미칠 수 있다. 2012년도의 한 연구에 따르면 췌장선암(pancreatic adenocarcinoma)에 대해 총허리근(total psoas muscle)을 이용하여 근감소증을 정의한 후 3년 생존률을 비교해 본 결과 술전 근감소증이 종양 특이적인 여러 변수와 별개로 독립적인 예후인자임을 보고하였고, 따라서 이를 환자의 허약함(frailty)을 측정하는 객관적인 지표로 이용할 수 있다고 하였다. 또한 2015년에 존스홉킨스 그룹에서는 근감소증 측정시 단일 CT 영상보다는 총허리근을 적분한 값이 근감소증을 더 정확히 반영하며, 앞 선 연구와 마찬가지로 다변량분석후 근감소증이 생존률에 유의미한 영향이 있다고 하였다. 이러한 경향은 췌장암뿐만 아니라 팽대부 주위암 등으로 인한 췌절제술에서도 찾아 볼 수 있으며, 이는 여자보다는 남자에게서 경향성이 뚜렷하다는 연구도 있다. 따라서 이를 종합하면 근감소증은 췌장선암 및 췌절제술을 시행받은 환자들에서 합병증 및 생존률에 대한 독립적인 예후인자 중 하나라고 생각되며,[28-30] 조만간 메타분석 등으로 확인해 볼 필요가 있다. 근감소증은 체내 지방량의 증가를 보통 동반하는, 골격근의 양과 강도가 진행적으로 감소하는 것으로 정의한다. 근육량 및 강도를 영상학적으로 진단하며, 신체 활동량의 감소가 동반되면 진단에 도움이 된다. 근감소증은 여러가지 내과적, 외과적 질환에 있어 생존률 등에 불량한 예후인자이며, 이는 췌장암 및 췌절제술 환자에게도 같은 결과를 보인다. 따라서 근감소증을 동반한 수술전 환자에게서 이를 개선할 수 있는 영양학적, 신체적, 약물적 치료법에 대한 연구가 시급하다. This study was supported by grant from the KSSMN and JW-pharma 2018 (중외학술상). Rosenberg IH. Sarcopenia: origins and clinical relevance. J Nutr 1997;127:990S-1S. Tian S, and Xu Y. Association of sarcopenic obesity with the risk of all-cause mortality: a meta-analysis of prospective cohort studies. Geriatr Gerontol Int 2016;16:155-66. Cruz-Jentoft AJ, Baeyens JP, Bauer JM, Boirie Y, Cederholm T, and Landi F et al. Sarcopenia: European consensus on definition and diagnosis: report of the European working group on sarcopenia in older people. Age Ageing 2010;39:412-23. Rutz DR, Squires MH, Maithel SK, Sarmiento JM, Etra JW, and Perez SD et al. Cost comparison analysis of open versus laparoscopic distal pancreatectomy. HPB (Oxford) 2014;16:907-14. Ome Y, Hashida K, Yokota M, Nagahisa Y, Michio O, and Kawamoto K. Laparoscopic radical antegrade modular pancreatosplenectomy for left-sided pancreatic cancer using the ligament of Treitz approach. Surg Endosc 2017;31:4836-7. Drymousis P, Raptis DA, Spalding D, Fernandez-Cruz L, Menon D, and Breitenstein S et al. Laparoscopic versus open pancreas resection for pancreatic neuroendocrine tumours: a systematic review and meta-analysis. HPB (Oxford) 2014;16:397-406. Yamamoto T, Satoi S, Kawai M, Motoi F, Sho M, and Uemura KI et al. Is distal pancreatectomy with en-bloc celiac axis resection effective for patients with locally advanced pancreatic ductal adenocarcinoma? -multicenter surgical group study. Pancreatology 2018;18:106-13. Bozzetti F, and Mariani L. Perioperative nutritional support of patients undergoing pancreatic surgery in the age of ERAS. Nutrition 2014;30:1267-71. Kim G, Kang SH, Kim MY, and Baik SK. Prognostic value of sarcopenia in patients with liver cirrhosis: a systematic review and meta-analysis. PLoS One 2017;12:e0186990. Shen Y, Hao Q, Zhou J, and Dong B. The impact of frailty and sarcopenia on postoperative outcomes in older patients undergoing gastrectomy surgery: a systematic review and meta- analysis. BMC Geriatr 2017;17:188. Jones K, Gordon-Weeks A, Coleman C, and Silva M. Radiologically determined sarcopenia predicts morbidity and mortality following abdominal surgery: a systematic review and meta-analysis. World J Surg 2017;41:2266-79. Peng P, Hyder O, Firoozmand A, Kneuertz P, Schulick RD, and Huang D et al. Impact of sarcopenia on outcomes following resection of pancreatic adenocarcinoma. J Gastrointest Surg 2012;16:1478-86. Joglekar S, Asghar A, Mott SL, Johnson BE, Button AM, and Clark E et al. Sarcopenia is an independent predictor of complications following pancreatectomy for adenocarcinoma. J Surg Oncol 2015;111:771-5. Fielding RA, Vellas B, Evans WJ, Bhasin S, Morley JE, and Newman AB et al, Sarcopenia: an undiagnosed condition in older adults. Current consensus definition: prevalence, etiology, and consequences. International working group on sarcopenia. J Am Med Dir Assoc 2011;12:249-56. Chen LK, Liu LK, Woo J, Assantachai P, Auyeung TW, and Bahyah KS et al. Sarcopenia in Asia: consensus report of the Asian working group for sarcopenia. J Am Med Dir Assoc 2014;15:95-101. Chien MY, Huang TY, and Wu YT. Prevalence of sarcopenia estimated using a bioelectrical impedance analysis prediction equation in community-dwelling elderly people in Taiwan. J Am Geriatr Soc 2008;56:1710-5. Kyle UG, Genton L, Hans D, Karsegard VL, Michel JP, and Slosman DO et al. Total body mass, fat mass, fat-free mass, and skeletal muscle in older people: cross-sectional differences in 60-year-old persons. J Am Geriatr Soc 2001;49:1633-40. Kang MJ, Jung HS, Jang JY, Jung W, Chang J, and Shin YC et al. Metabolic effect of pancreatoduodenectomy: resolution of diabetes mellitus after surgery. Pancreatology 2016;16:272-7. Martin L, Birdsell L, Macdonald N, Reiman T, Clandinin MT, and McCargar LJ et al. Cancer cachexia in the age of obesity: skeletal muscle depletion is a powerful prognostic factor, independent of body mass index. J Clin Oncol 2013;31:1539-47. Liu P, Hao Q, Hai S, Wang H, Cao L, and Dong B. Sarcopenia as a predictor of all-cause mortality among community-dwelling older people: a systematic review and meta-analysis. Maturitas 2017;103:16-22. Endo T, Momoki C, Yamaoka M, Hachino S, Iwatani S, and Kiyota S et al. Validation of skeletal muscle volume as a nutritional assessment in patients with gastric or colorectal cancer before radical surgery. J Clin Med Res 2017;9:844-59. Choi MH, Oh SN, Lee IK, Oh ST, and Won DD. Sarcopenia is negatively associated with long-term outcomes in locally advanced rectal cancer. J Cachexia Sarcopenia Muscle 2018;9:53-9.
van Vugt JLA, Buettner S, Levolger S, Coebergh van, den Braak RRJ, Suker M, and Gaspersz MP et al. Low skeletal muscle mass is associated with increased hospital expenditure in patients undergoing cancer surgery of the alimentary tract. PLoS One 2017;12:e0186547. van Vugt JL, Levolger S, de Bruin RW, van Rosmalen J, Metselaar HJ, and IJzermans JN. Systematic review and meta-analysis of the impact of computed tomography-assessed skeletal muscle mass on outcome in patients awaiting or undergoing liver transplantation. Am J Transplant 2016;16:2277-92. Sandini M, Bernasconi DP, Fior D, Molinelli M, Ippolito D, and Nespoli L et al. A high visceral adipose tissue-to-skeletal muscle ratio as a determinant of major complications after pancreatoduodenectomy for cancer. Nutrition 2016;32:1231-7. Onesti JK, Wright GP, Kenning SE, Tierney MT, Davis AT, and Doherty MG et al. Sarcopenia and survival in patients undergoing pancreatic resection. Pancreatology 2016;16:284-9. Amini N, Spolverato G, Gupta R, Margonis GA, Kim Y, and Wagner D et al. 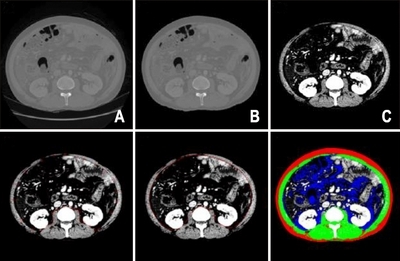 Impact total Psoas volume on short- and long-term outcomes in patients undergoing curative resection for pancreatic adenocarcinoma: a new tool to assess sarcopenia. J Gastrointest Surg 2015;19:1593-602. Pecorelli N, Capretti G, Sandini M, Damascelli A, Cristel G, and De Cobelli F et al. Impact of sarcopenic obesity on failure to rescue from major complications following pancreaticoduodenectomy for cancer: results from a multicenter study. Ann Surg Oncol 2018;25:308-17.